New Delhi: The Prime Minister, Shri Narendra Modi, visited BHU in Varanasi today. 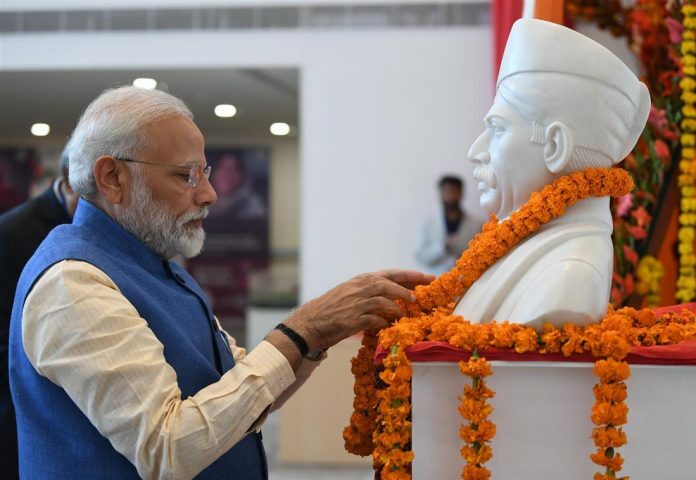 He unveiled statue of Pandit Madan Mohan Malaviya along with Murals of Varanasi Ghats. He offered floral tributes at statue of Pandit Madan Mohan Malaviya. Governor of UP Shri Ram Naik, CM of UP Shri Yogi Adityanath, and other dignitaries were present on the occasion. He also inaugurated Pandit Madan Mohan Malaviya Cancer Hospital and Bhabha Cancer Hospital, Lahartara. These Hospitals will provide comprehensive treatment to the patients from UP, and nearby states of MP, Chhattisgarh, Jharkhand, Bihar. PM also dedicated first New Bhabhatron with precision technology, to the nation. He visited Day Care Unit & OPD and interacted with the patients. PM also interacted with the beneficiaries of PMJAY- Ayushman Bharat.